The most important decision you will make in this life is what you do with Jesus – whether or not to believe in Him and His word, and live by what He taught. We know what the world says about Jesus, but they don’t really know Him and they’re dead wrong! Most people haven’t read the Bible nor have they sincerely pursued the truth. We’re in a verse by verse study through the Gospel of Matthew. We’re in chapter 16, which reveals who Jesus is, what He came to accomplish, and some of the opposition He faced. Jesus Predicts His Suffering, Death & Resurrection! My first reaction was to chuckle; then my heart sank as I realized she was serious, and worse – there are thousands who have the same false ideas about Jesus, the Bible, and religion. Our work sure is cut out for us. It is imperative we know the truth. A great human teacher wouldn’t claim to be God and a good man wouldn’t lie. But a great Savior would live what He preached, provide evidence for His claims, give people hope, and radically change the world. Jesus did. 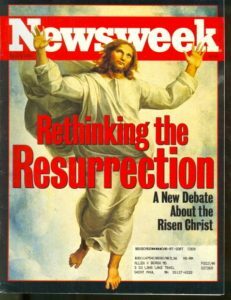 Here are just a few magazine covers out of hundreds over the years that cast doubt on who Jesus is and criticize Christianity. There’s much skepticism about God and religion. 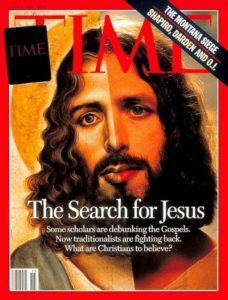 Since around the 1960s, when secular publications or TV shows deal with the subject of Jesus Christ, you know there are going to be lies, confusion, mocking, and unfounded speculation. Apparently, they’re unwilling to look at proof of the accuracy and reliability of the Bible. Sadly, millions have not examined the evidence supporting Christianity, have not read the Bible, and have not heard the true gospel. Many say they believe in another Jesus. Some people say Jesus was a good teacher, a prophet, an angel, a liar, a lunatic, a Rabbi, a religious leader, or one of many gods. Doesn’t this sound like the popular but naive “coexist” philosophy? 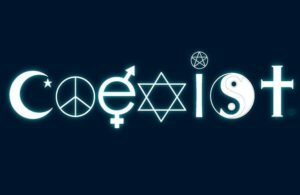 The coexist sticker was created to oppose Christians, claiming we are just supposed to be silent, not share the gospel, and be tolerant of all religions – no matter what they teach – even though clearly, they are on the road to destruction. Buddhists believe Jesus was just an enlightened man, and we can work our way to salvation. Hinduism teaches reincarnation, karma, and that there are millions of gods. Jesus is one of many. Jehovah’s Witnesses believe Jesus was a created being (Michael the Archangel) & the cross is a pagan symbol. Mormons believe Jesus was a god, a prophet, and the spirit brother of Lucifer. Muslims believe Jesus was just a man, a prophet. Islam teaches he didn’t really die on a cross! Unitarians believe Jesus was no more divine than you or me, but was a great teacher and a faith healer. In this context, he basically told the church at Corinth not to fall for any other Jesus, spirit, or gospel than what the church was founded upon. Don’t accommodate, bear it beautifully or put up with those teachings. Believe only the true gospel of Jesus. Scripture teaches about the coming of the Messiah, and Matthew wrote primarily to a Jewish audience. Remember, Jesus did not come to abolish the law but to fulfill it. The religious leaders however, did not want any part of it. Let’s look at some background on the Jewish religious leaders. First, the Pharisees and Sadducees were long-standing enemies. The Pharisees lived by even the smallest points of the oral law and believed in bodily resurrection. Pharisees were not political, and they looked for the coming of the Messiah (Sadducees did not). Notice Jesus confirms the “story” of Jonah and treats the Old Testament as literal history. Regarding the idea of three days and three nights, this was a common expression about the prophetic significance of a period of time. (Similar to “forty days and forty nights”) Some think Jesus would have to wait until Sunday night in order to classify as three nights in the tomb. If Jesus was crucified on a Friday, and His resurrection occurred on the first day of the week, by Hebrew reckoning this would qualify as three days and three nights. After the preceding conflict with the religious leaders, Jesus gave this advice to His disciples, using the metaphor of leaven. As noted previously in the parable of the leaven (Matthew 13:33), the kingdom of God was pictured as yeast permeating all that it comes in contact with. Leaven was used as a picture of sin and corruption, especially in the Passover narrative in Exodus. It was a Jewish expression for evil influence. But the disciples didn’t get it. How did they respond? This was a strange concern in light of the fact Jesus just miraculously fed crowds exceeding 5,000 and 4,000 people on two separate occasions. The disciples didn’t understand and He said, “You of little faith,” and reminded them of the recent miracles. In this passage, Jesus rebukes the disciples for 3 things: their ignorance, unbelief, and their forgetfulness. They got the message! Their mission takes them to Caesarea Philippi, about twenty-five miles northeast of the Sea of Galilee. And Jesus is preparing to ask two very important questions against the backdrop of the world’s religions and idols. Caesarea Philippi had a large Gentile population, an area associated with idols and rival deities. The area had temples of ancient Syrian Baal worship, and a nearby cavern was even said to be the birthplace of the great god Pan, the god of nature. There was also a great temple of white marble built to the godhead of Caesar. They mention three types of leaders in their response. John the Baptist, Elijah, and Jeremiah (and other prophets) were national reformers who stood up to the corrupt rulers of their day. Some thought Jesus was a herald of national repentance like John the Baptist. Some thought Jesus was a famous worker of miracles like Elijah. Others thought Jesus was someone who spoke the words of God like Jeremiah and the prophets. What do these answers have in common? They all underestimate Jesus, the Messiah. Even after He performed many signs and wonders, some people were still uncertain about His role. Even John the Baptist wondered why Jesus was spending most of His time out in secluded or densely-populated areas rather than in Jerusalem, the city of the King. Jesus responded this way because these signs confirmed the Messiah. John would have known that. Back in Matthew 16, in contrast with the dead idols of Caesarea Philipi, Peter confessed Jesus as the Christ, “the Son of the living God” which was an Old Testament name for Jehovah. Never before had Jesus taught His disciples the fullness of His identity. Until now. God the Father opened up Peter’s eyes revealing to him who Jesus really was, and Scripture reveals it was a blessed moment of divine inspiration as Peter received a revelation from God. Was the church then, built on Peter as some think? First, in the New Testament it is clear that Christ is the head, cornerstone, and foundation of the church. It is a mistake to think He is assigning any of these roles to Peter. A boulder-like truth came from the mouth of one who was called a small stone. The words “this rock” have been the source of much controversy. It is best to see them as referring to either Jesus Himself or as referring to Peter’s confession (revelation knowledge) of the Christ. Peter means “rock” (Greek) or Petros, but in the very next use of the word (upon this rock), Jesus used “petra” for little rock, a feminine form for rock, (foundation stone) not a name. Jesus is saying that “upon this rock” – upon this divine revelation/your profession of faith in Christ – I will build My church. Matthew is the only one to use this ancient Greek word. Significantly, this was well before the beginnings of what we normally think of as the church on the Day of Pentecost in Acts 2. Death has been defeated and Satan has no power to stop the church. In fact, the blood of martyrs has sped the growth of the church. Jesus brings His people together for a common purpose, builds His church on a firm foundation, and establishes a stronghold against the enemy. What about this concept of keys to the kingdom? Is the common idea of St. Peter at the Pearly Gates holding the keys to heaven at all Scriptural? Not at all. Some think Peter has authority to say who gets into heaven and who is turned away to hell. Peter does have a special place among the disciples and is often listed first when mentioned in the gospels, but one must read into Scripture in order to interpret Jesus giving higher authority to Peter over everyone else. If Jesus did give Peter keys, there is no evidence of instruction to pass them on to others. Keys represent authority, not access to heaven (salvation is achieved only through Jesus, by God’s grace through faith in Him!). What about the custom of binding and loosing? This is to be in context of Matt. 18:15-17 where Jesus gave instructions on dealing with sin in the church. True Christians can declare and discern if someone in the church is forgiven based on God’s Word. In other words: whatever we bind or loose on earth has already been bound or loosed in heaven. “Binding” and “loosing” were administrative terms in daily Jewish life; whenever a Jew came up against the Law of Moses, that Jewish person was either “bound” or “loosed” in regard to that law. To loose was to permit; to bind was to prohibit. To loose was to free from the law, to bind was to put under the law. Jews would recognize this. This also represents authority, and Jesus promises that Peter – and the other apostles – would be able to set boundaries or rules for the New Covenant community. Some of the instruction became the Gospels and New Testament. Nothing in the New Testament teaches that Peter became pope. The “rock” upon which the church would be built wasn’t Peter, but his confession of faith in Jesus the Christ. No apostle attained supremacy in New Testament times. Paul stated he was not inferior to any other apostle. Early church history (Acts) argues against the existence of the papacy. Peter was definitely not infallible. The “keys to the kingdom” relate only to Peter’s privilege of preaching the gospel, and have nothing to do with the entrance to heaven. Why tell no one? Why did He often give these warnings? Wouldn’t He want people to know He is the Messiah and confirm His deity? One concern was zealots that would want to make Jesus king. Another issue was the fact that His miracles, for example, might hinder His mission and divert public attention from His message of repentance. Word traveled fast even with no modern technology! A third reason Jesus warned not to share the news was His timing had not yet come to go up to Jerusalem to be the sacrificial lamb. Matthew’s gospel takes a new direction now and begins emphasizing Jesus teaching His disciples exactly why He came and what He came to do. The public ministry of Jesus was now to be focused inward toward those closest to Him and include private instruction. The tone would go from joyous to somber as He now had to prepare them for His suffering and crucifixion. Jesus’ purpose was to die as an atonement for sin. Notice Peter reacted in typical ‘act first’ fashion by rebuking Jesus. Can you imagine? This was truly from the pit of hell as Peter unknowingly became a mouthpiece for Satan opposing the will of God. The harsh rebuke from Jesus was justified. It also appears from the text that Jesus cut Peter off and didn’t allow him to finish speaking. Notice it says Peter “began to rebuke Him.” Jesus stopped Peter as his words did not line up with God’s will. Being mindful of the things of men is a satanic way of thinking. One lesson for us is to set our hearts and minds on the things of God and seek first His kingdom and righteousness. Even after a wonderful revelation from the Lord, we can still miss God’s best if we are not discerning and open to His will. The more we know Him the better we can proclaim Him to others. …Therefore God has highly exalted him and bestowed on him the name that is above every name, 10 so that at the name of Jesus every knee should bow, in heaven and on earth and under the earth, 11 and every tongue confess that Jesus Christ is Lord, to the glory of God the Father. That is the inescapable question. He alone can redeem you—free you from the power and penalty of sin. He alone can transform you, restore you to fellowship with God, and give your life eternal purpose. Will you repent and believe in Jesus Christ as your Lord and Savior? We know what the world says about Jesus. What does the WORD say? Isn’t this our authority as Christians? Have you been equipped at your current church, and are you growing in the grace and knowledge of Jesus? Is doctrine a top priority? Are you prepared to answer whomever might ask you the reason for the hope you have in Christ? 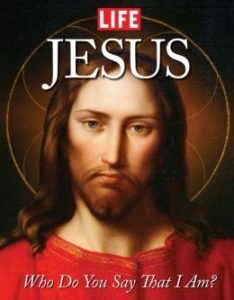 Jesus Christ is the Author of Life, Perfecter of our Faith, the Light of the World, Lord of Lords, King of Kings, Jehovah, Son of Man, The Great I Am, Creator, The Door, The Gate, The Way, Truth, The Life, Wonderful Counselor, Mighty God, Everlasting Father, Prince of Peace, Healer, Conqueror, Redeemer, Emmanuel, God with Us, Savior & Soon-coming King!